As with all Charlotte Tilbury products, the packaging is stunning - even the box is pretty with glitter on it! Inside are four trios of eyeshadows to create four different looks but, of course, the shadows can be mixed and matched. 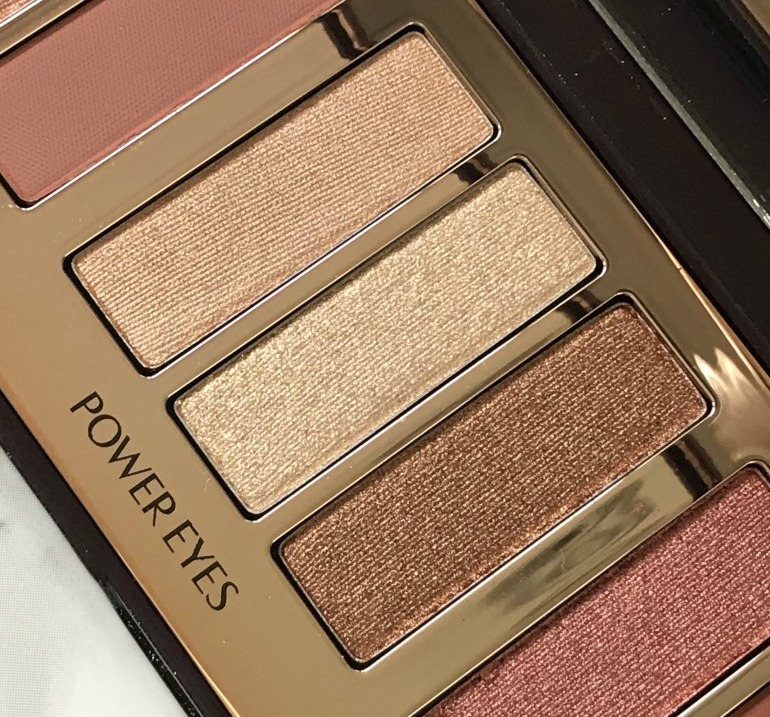 I prefer the shade selection of the Stars In Your Eyes palette to last year's Instant Eye Palette as they are warmer and more versatile. Also, in general, the texture of the shadows in the Stars In Your Eyes Palette is superior to last year's palette. Each trio contains a prime, enhance and smoke shade as that's how Charlotte recommends applying her shadows. The first trio is Love Eyes. I was pleasantly surprised by this trio as it doesn't look particularly exciting in the pan but that middle shade reminds me of MAC Melon pigment, which I used to wear all of the time. The prime shade is a medium cream matte. The enhance shade is a warm peachy/gold metallic and the smoke shade is a matte light terracotta. 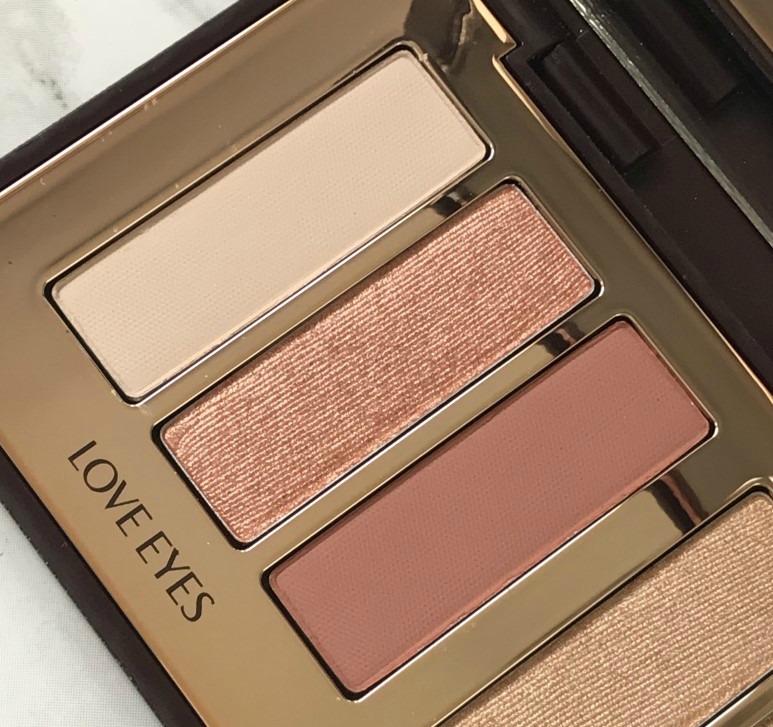 I find the three shades work well to create an easy everyday eye look but when the middle shade is applied, it spruces the look up for an evening out. The texture of all three shadows is smooth and very easy to work with. Next up is Power Eyes. 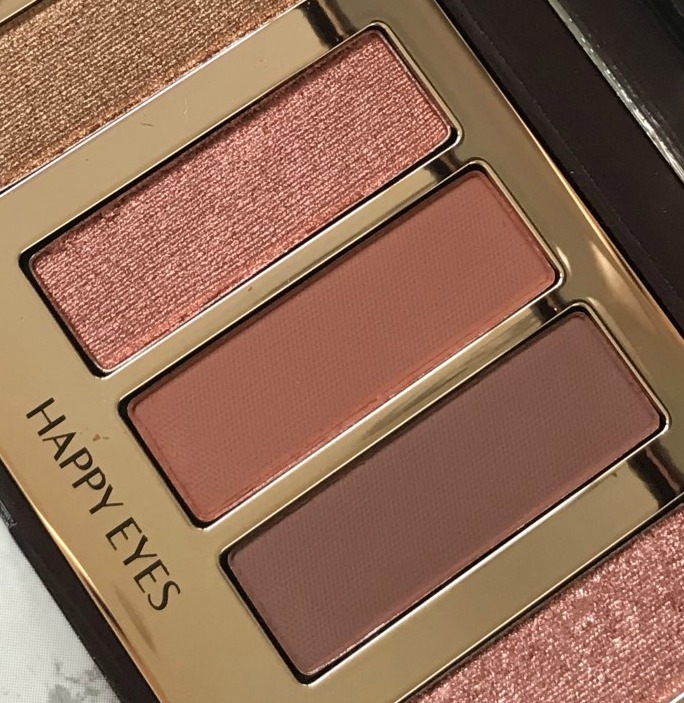 The shades in this trio very much remind me of some of the shades in the original Urban Decay Naked palette, which is not a bad thing because I loved that palette (R.I.P. Naked 1). The prime shade is a satin pale gold/champagne colour with a smooth finish. The enhance shade is a disappointment as it isn't very pigmented and almost feels like it has a layer of something on it that is preventing you from getting to the shadow. It can be layered to build up pigmentation but I feel like I have to dig my brush into it. The smoke shade makes up for the disappointment of the enhance shade because it is a super pigmented, buttery soft, bronze metallic shade. It's worth buying the palette for this shadow alone! Next up is Happy Eyes. I love the russet tones in this trio. The prime shade is a buttery soft, finely milled burgundy metallic - a dream to use. The enhance shade is a matte terracotta - pigmented, smooth and easy to blend. The smoke shade is a matte burgundy-toned brown. Again, this is a pigmented, finely milled shadow, which is easy to use. I really love this trio and will be wearing it a lot over the coming months! Finally, there is Confident Eyes. In the pan, this purple toned trio looked like it would be my favourite but sadly, it isn't because the prime shade feels like it has a film on it, just like the enhance shade in the Power Eye. Again, I can layer it but at £60 for a palette, I don't think that the shadows should be hard work (total first world problem, I know!). The enhance shade is a metallic medium cranberry that is smooth, pigmented and creamy soft. The smoke shade is a deep berry matte shade. Again, it is pigmented and finely milled so very easy to work with. Overall, I love the shade selection in this palette and apart from two, the texture is smooth and buttery soft. I like that there is a good mix of mattes and metallics so I can create daytime, subtle looks as well as more dramatic looks. I always prime my eyes and find these shadows last all day without creasing or fading. Like I said earlier in the post, I wasn't going to buy this palette but I am glad I have it in my collection. £60 for a palette isn't cheap but Charlotte Tilbury is a luxury makeup brand and in comparison to her £39 quads, it's good value. It would make a fabulous Christmas gift for any makeup fan but it's limited edition so if you want to get your hands on it, you need to act fast! Available from Charlotte Tilbury and will be on counters later this month. 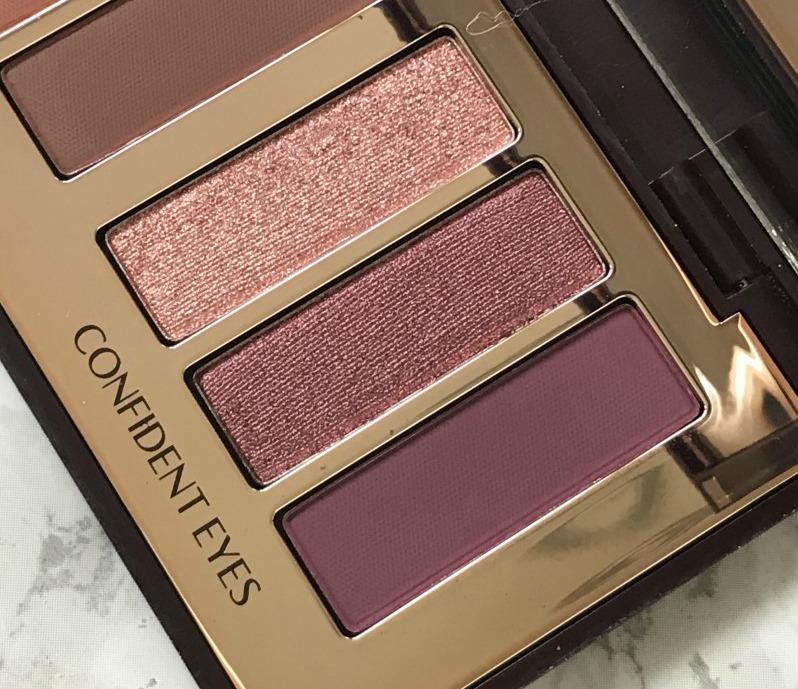 Are you tempted by this palette? 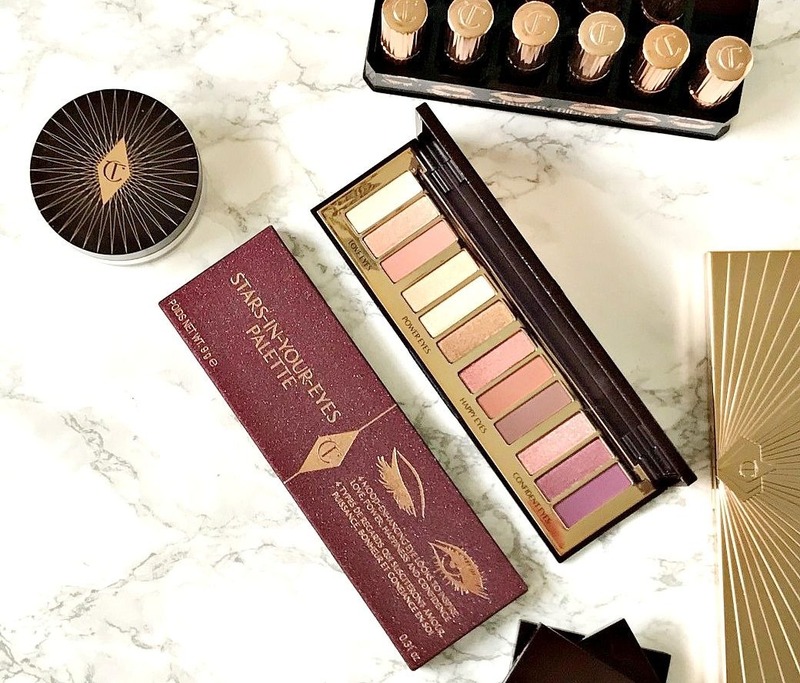 Are you a fan of Charlotte Tilbury makeup, in general? I'd love to hear!